Among runners in particular, and in the athletics community more broadly, you would be hard-pressed to find anyone unfamiliar with the mythic story of Roger Bannister’s four-minute mile. The legend, as we’ve grown accustomed to hearing it, is that in the months and weeks leading up to his breakthrough, sportscasters and scientists the world over decried Bannister’s goal as an impossible task. The four-minute mile, they told him, lay beyond the physical limits of human capability. But Bannister was not dissuaded. On May 6th, 1954, at an Oxford University track meet, paced by his countrymen Chris Chataway and Chris Brasher, Bannister tore four rapid, relentless laps around Iffley Road Track to clock, by the skin of his teeth, the world’s first-ever sub-four-minute mile. The crowd waited with bated breath to hear confirmed the feat they had just witnessed. The crowd erupted in cheers, drowning out the words that followed. 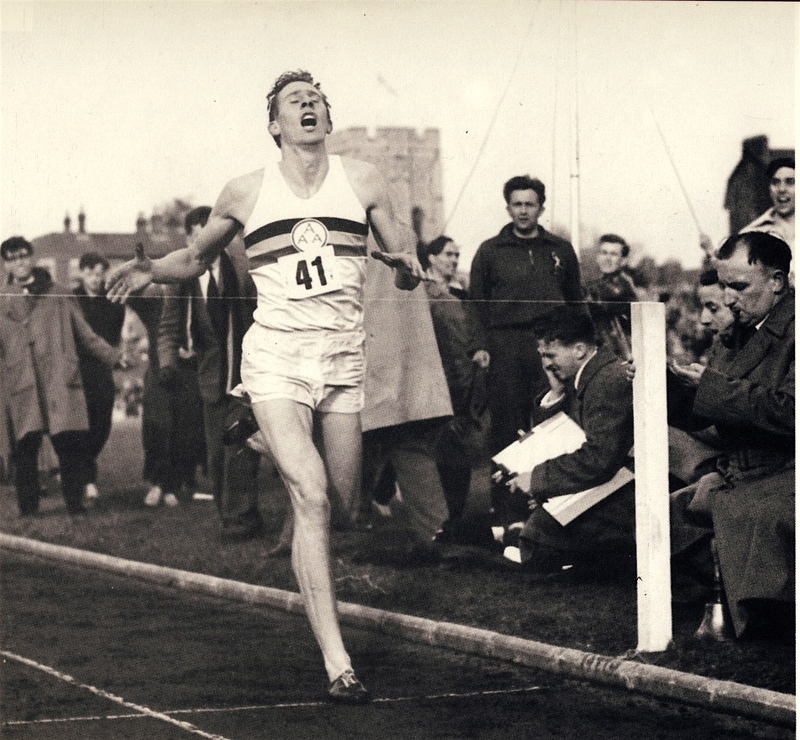 Bannister had clocked a world record time of 3:59.4. His new world record – that impossible task, the mythic four-minute mile – stood for only a fleeting 46 days. The story of the four-minute mile is supposed to be a story of mind-over-matter, a story about how one man, undaunted by the challenge set before him, broke through an unbreakable barrier, and paved the way for generations who would run after him. It’s a story about self-belief, about the indomitability of the human spirit in the face of impossible odds. Only that’s not really what it’s about at all. That the four-minute mile was thought impossible by informed contemporaries of Bannister is, as it happens, a romantic myth. Bannister himself has touched upon this widely propagated historical error in his own memoir, penned just a year following his record-breaking race. The previous world record at the time of Bannister’s run was a tantalizing 4:01.4. But while other world records in the mile typically stood for about a year at a time before falling, the 4:01.4 of Sweden’s Arne Andersson remained unbested for a whopping nine years. So why did world record progression in the mile come to such a standstill for nearly a decade? The answer lies in the timeline. In the chaos and upheaval of the Second World War, athletic progress in combatant countries came to a grinding halt. The war saw the suspension of international competition, as well as the cancellation of both the 1940 and 1944 summer Olympic Games in Tokyo and London, respectively. Faced with the spectre of fascism haunting Europe, the Greatest Generation set aside feats of athletic endeavor to fight a war that would come to define the century. It was nearing the end of the decade before international athletic competition was able to resume in any meaningful way. In this context, the human ability to clock a sub-four-minute mile appears, in a broad sense, to be an unremarkable feat. Bannister didn’t defy the physical limitations of the species with his world record performance; he merely continued the steady advancement of athletic endeavor which had been paused nine years earlier. If it hadn’t been him, it would have been someone else. Bannister broke down a barrier that was well within the reach of our human capacity. But like all great human endeavors, the four-minute mile lay within the grasp of a dedicated few only by virtue of the blood, sweat, and sacrifice of untold millions. Athletic endeavor, like literature, art, or any great and laudable human creation, is made possible only by a world that exists in a state of relative freedom and peace. It is easy, and often all too convenient, to relegate athletics to the realm of frivolity, to regard it as a luxury of peace and affluence. But it’s so much more than that. To borrow a phrase from C.S. Lewis, himself a contemporary of those turbulent, war-torn decades, great endeavors such as these may indeed be unnecessary – they have no survival value. Instead, they are what gives value to survival.